I would like hear outtakes of "All my loving" "It won't be long" and the famous "Twist and shout" take 2! Re: stuff in the "archives" not circulating underground: Whether or not there's danger of it being booted, it loses its copyright protection. So if, for example, Universal Music decides not to bother copyrighting outtakes of a song and then, three years from now, issues a disc called "Recording Sessions," that material will be free of copyright because it was not published before the end of 2013. So that Universal Music release would essentially be the same as a grey market release - and a grey market company could pick up the recordings and release them in a different edition the next day without fear of a suit on the basis of copyright. There's also "She Loves You" and "Twist And Shout" from the Sweden October 1963 tour. A question; The material that has remained safely unbooted from 1963 is just that, safe? So long as it doesn't get out it will remain there? What about protection of copyright of this material? The whole Aug 21 '63 Gaumont Cinema Bournemouth show. Portions of this were played on one of those local BBC radio shows last year, and includes "Roll Over Beethoven," "A Taste of Honey," "Baby It's You," "She Loves You," and "Twist and Shout." What makes this tape great is that it was recorded a month or two before full-scale Beatlemania hit, so the audience is a bit subdued and you can actually hear the Beatles play. Why did the Beatles/Apple release just 15 studio outtakes when there are many more? For example the Please Please Me Studio Sessions Bootleg has 9 different takes of Misery. Why didn't they release all of the outtakes for PPM and call it Please Please Me (Bootleg)? There's also the 1963 Christmas fan club record. And what about video? There are loads of TV appearances. Under the copyright scenario, seems like someone could put together a fairly comprehensive for-profit DVD anthology for 1963. Bournemouth August 1963 Concert tape was partially aired on BBC radio earlier this year. 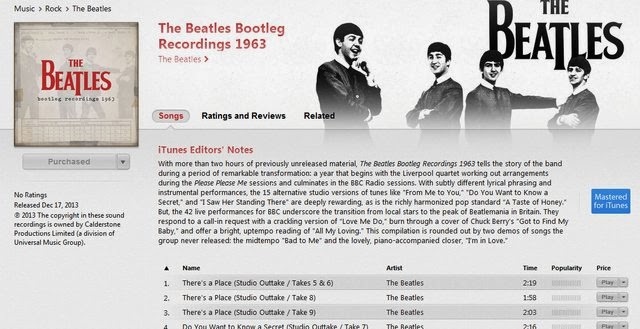 Apple should consider releasing this amazing look into the beginning of Beatle-mania. This performance has some great songs such Baby its You and Chains with one of the first live performances of She Loves You…. The Christmas records are protected. The individual releases from 1963-1969 takes care of that, even if they were sent free of charge to fan clun members, they certainly count as released. Outtakes from the recording of these still remain unreleased. Why Universal and not EMI anymore? what did I miss? Dogma: You missed that EMI was bought by Universal. Parlophone was actually sold off, but The Beatles remain at Universal. As for the TV appearances, jfire: when it airs, it's released; until then, it's not. Assuming the tapes are still around (BBC loved to erase them — just as Dr. Who), then they are covered by copyright. And all movie outtakes are copyright by the fact that United Artists would have filed ownership of the footage in their parent country, and USA now allows anyone to keep their product out of the public domain. Purple Chick's Deluxe Versions of Please Please Me and With The Beatles have loads more outtakes than are listed here...?